"I am writing to thank you for the work you completed on our house this year. The paintwork was to a high standard and your staff were a pleasure to have working around the house". "I have no hesitation in recommending your company to anyone who may be considering you". "Wishing you good luck with your future work". "These photos don`t do justice to your expert decorating skills". "That Mr C.May of Perfection Painting has satisfactorily completed the decoration to my home for which he was contracted under the reference claim". "That his workmanship in the decoration of the adjacent ceilings walls and of the stairs and hallway is exemplary". "That he has impressed me in every respect as meticulous in detail and the completed work is exceptionally outstanding". "Based upon our favourable experience, we are pleased to recommend Perfection Painting". "Carl May, the proprietor works to a very high standard of painting and decorating and has a pleasant and cooporative manner". Mr & Mrs Renouf - Nottingham. "Thank you so much for doing such an excellent job once again-will not hesitate to recommend you". "Attention to detail is very good. Quality service at a competitive price". "Very good service, friendly and brilliant job done". "Highly professional response to customers’ needs. Would recommend to anyone". "Would happily recommend Perfection Painting".
" A brilliant job done with excellent service. We will use in the future". "Carl was excellent. Have used him twice now". 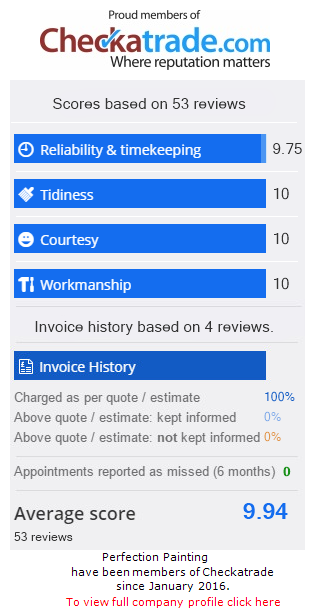 "Very professional and courteous company. Job well done". "Very clean and tidy worker". "An excellent painter and decorator"